They say that on Etsy, to get your stuff seen, you need to not post lots of stuff, but to post something every day. Somehow that gets you a higher rating. I'm no expert, so I don't really know how that works. I do know that writing my blog gets the juices moving for me, so that when I get to listing an item I'm able to write its description more easily. And that, though the mittens and hats I make are really well received in person, that doesn't seem to translate on screen. I'm sure it has something to do with the photos. 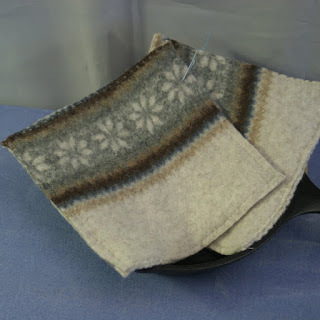 Last year, however, people on Etsy liked my pot holders, so that's what I've been listing lately, in the dearth of needle felted stuff around here. So here's a pair I like because of the snowflake design.